"Bridal Veil Lumbering Company, Bridal Veil, Oregon"
Click image to enlarge Bridal Veil Post Office, Bridal Veil, Oregon. Image taken June 29, 2005. The Bridal Veil Lumbering Company came into existence in 1886 and became one of Oregon's oldest lumber companies. 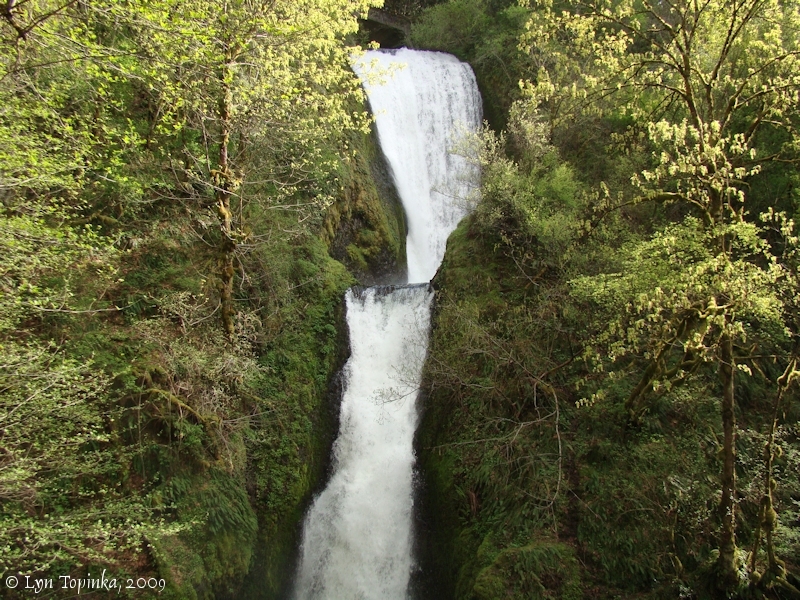 It was located near the base of Bridal Veil Falls. After 75 years the company shut its doors in 1960 as profits dwindled. 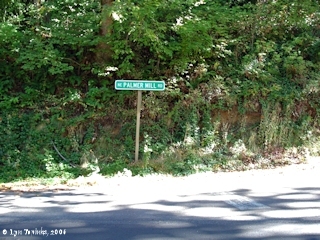 The Oregon community of Bridal Veil evolved as a company mill town in the 1880s when one of Oregon's first paper mills was established on Bridal Veil Creek. 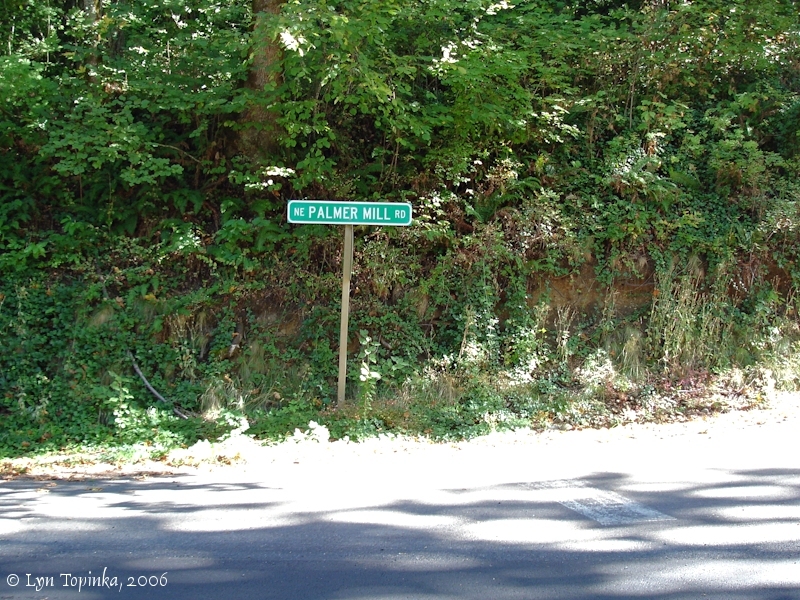 A small community developed around the papermaking mill for the families of the workers. 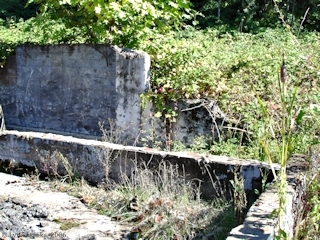 It was followed by the Bridal Veil Falls Lumbering Company that consisted of a logging operation and saw-mill on Larch Mountain, and a planing mill at Bridal Veil. 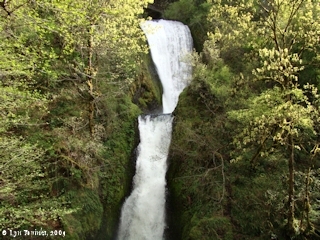 Click image to enlarge Bridal Veil Falls, Bridal Veil, Oregon. Image taken April 26, 2009. In 1991 the Trust for Public Lands acquired the property intending to donate it to the State of Oregon for a park. The buildings were removed. As of 2003 (McArthur and McArthur, 2003) this ownership exchange had not yet been done. 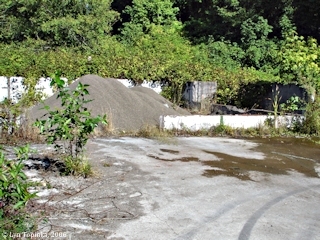 When this web author visited in September and October 2006 the area appeared to be a holding area for road construction equipment. 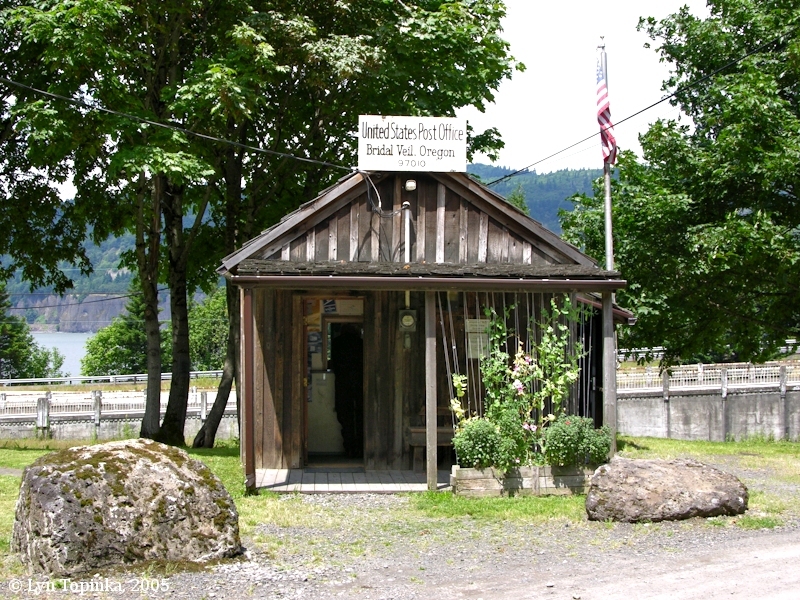 One building remaining in existence is the Bridal Veil Post Office, once the toolshed for the Bridal Veil Lumbering Compnay. Click image to enlarge Penny Postcard: Logging Camp, Bridal Veil, Oregon, ca.1910. Penny Postcard, ca.1910, "Logging Camp, Bridal Veil Falls, Oregon." Published for the J.K. Gill Co., Portland, Ore., by M.R., L.A. Card #3985. Made in Germany. In the private collection of Lyn Topinka. 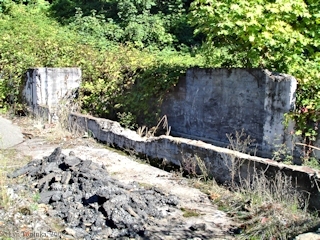 Click image to enlarge Area which once was the Bridal Veil Lumbering Company. View from the Bridal Veil Post Office. Image taken October 21, 2006. 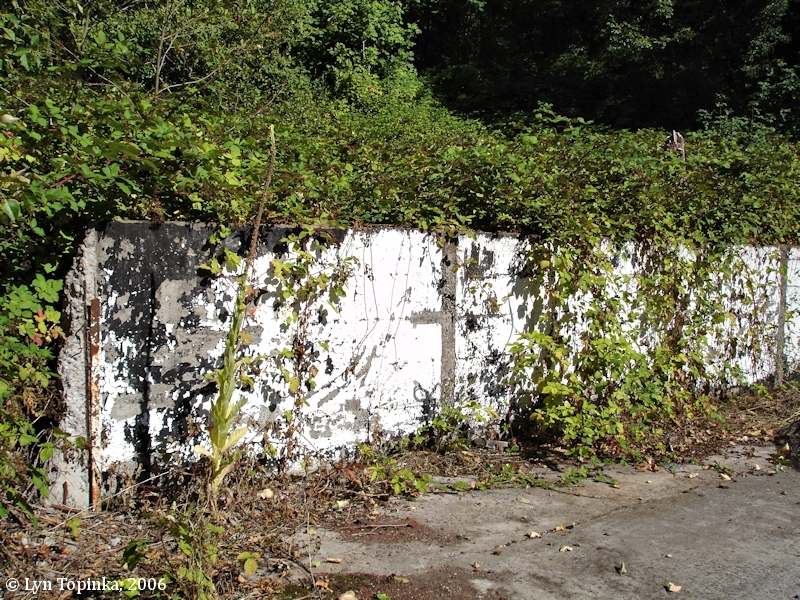 Click image to enlarge Wall remnant, Bridal Veil Lumbering Company. 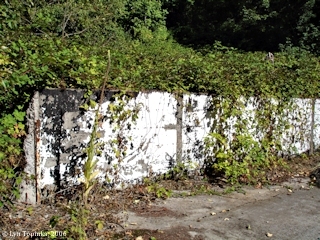 Image taken September 23, 2006. Click image to enlarge Wall remnants, Bridal Veil Lumbering Company. Image taken September 23, 2006. Source: In 2001 Tom Cowling published a nice collecion of history, information, and remembrances about early Bridal Veil and nearby communities such as Palmer. (Cowling, Tom, 2001, "Stories of Bridal Veil, A Company Mill Town, 1886-1960", produced for Crown Point Country Historical Society, and published by Stuart F. Cooper Company, L.A., Calfornia). "The Bridal Veil Lumbering Company, located on the main line of the O.R. & N. Co., 30 miles east of Portland, conducts one of the most unique, and at the same time one of the most complete lumbering plants on the Coast. The company owns and operates its logging camps, it cuts its timber from its own timber lands, and except for a little minor work, it does not use a horse or other power aside from that of steam about the entire property. 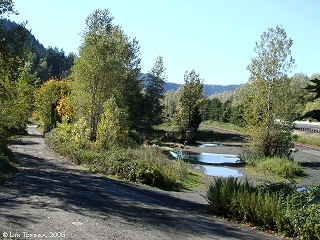 The forest belt from which the timber for the mills is cut is situated on Larch Mountain, several miles back from the railroad. The general elevation of this timber land is several hundred feet above that of the river and railroad line which furnish the most available means of tansportation for the large product of this company. A mill with a daily capacity of 100,000 feet of finished lumber is located upon Larch Mountain. The point of location is convenient to the timber belt. 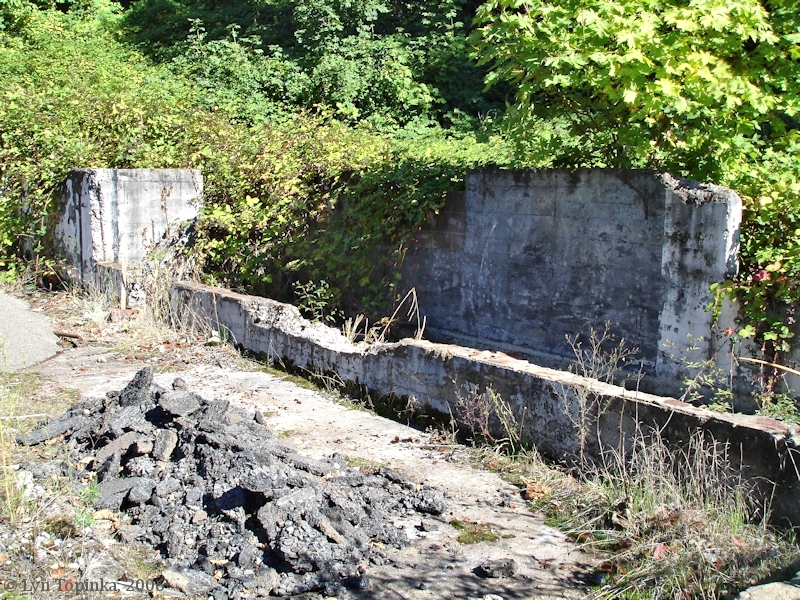 From this mill a flume three miles in length leads to the main yard and planing mill at Bridal Veil, the seat of the company's headquarters, and located on the Columbia River and main line of the Oregon Railroad & Navigation Company's tracks. As fast as lumber is cut from the logs at the mill on the mountain it goes floating away to the yards through the miles of flume. When this lumber reaches the yard it is picked up and yarded, or put through a dry kiln, or loaded on cars for shipment. Timber grown in this altitude is much superior to timber of the forest belts of lowlands. The timber of Larch Mountain is free from pitch, and also from the coarse grain found in trees of a rapid growth. Lumber cut by the Bridal Veil Lumbering Company is especially valuable for finishing work, and it is consequently in much greater demand than coarser grained lumber on the market. At Bridal Veil station, the O.R.& N. Co., is building his main track closer to the river, thus affording the Bridal Veil Lumbering Company considerable additional needed room. Taking advantage of the increased space afforded, the company next Spring will rebuild their planing mill, increasing its capacity about one-third. They will also build at this site a new dry kiln. A new 200-horse-power engine was recently installed at their saw mill on the mountain. This replaced the old engine which was not of sufficient capacity to meet the increased requirements of this plant. This company was the first of the saw mill companies to use the log trolley. This was described fully in The Oregonian, issue of November 24 last. By means of this trolley, logs are picked up out of the canyons and other places formerly practically inaccessible, and placed upon cars or skid roads which furnish easy transport to the mill. The use of this trolly greatly facilitates logging in a rough country." "While the company's plant at the foot of Larch Mountain is not unlike other saw mill plants in successful opertation in a heavy timber belt, its methods of logging are totally unlike those of any other milling company in the world. It is in the unique methods of logging by the Bridal Veil Lumbering Company that the interest of this article centers. Trees, many of them of tremendous diameter and height, thickly stud the mountain side. These trees are felled and cut into logs in the ordinary manner of these Wewstern lumbering forests, after which donkey engines, mounted upon heavy sleighs made purposely for them, gather the product in from all directions. Long cables are employed for this purpose, and they can strip an acre or two of saw logs at a single setting. This process is called "yarding", and when a section has been cleared the donkey and sleigh are moved, by using the cables, to another place. "Bull" donkeys of greater strength than "yarding" donkeys, with their endless cables, haul the logs from the "yard" to a logging railroad, and this latter delivers them at the mill. The "bull" donkeys use a skid road, but the railroad, upon which is run a powerful Baldwin locomotive, is constructed much the same as any other railroad, only it has no cars in its equipment. The logs, rounded (or "sniped") at one end, are drawn over the ties, one trailing after the other -- a string of them half a mile long, sometimes -- and their passing over them does not seem to injure the ties in the least degree. Not a team, save those that haul supplies to the camps, is to be seen in all the woods of this big lumbering concern, the steam donkeys having proven themselves so great economizers that they are bound to supplant almost entirely old methods everywhere. A "bull" donkey's strength and power is so applied that 30,000 feet of logs may be moved at one time, requireing a tension of 120,000 pounds. Three "yarding" and three "bull" donkeys are employed. The arrangements for logging and cutting timber are so perfect that some rapid work has been done by this company. So rapidly is all this work done, in fact, that a tree standing in the forest in the morning has been felled, sent to the mill, cut into lumber, "flumed" to the railroad, passed through the planing mill and dryer and in condition for the builder before the sun had set." Source: "The Morning Oregonian", Wednesday, January 1, 1902, courtesy Historic Oregon Newspapers Archives, University of Oregon Libraries, 2012.